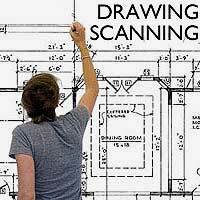 Drawings scanning and digital conversion is the next step forward for any business that currently keeps drawings, plans or blueprints in paper form. The scanning process helps to keep them safe and save room as well as making them easier to go through and work with which is an excellent move for efficiency. No matter if your drawing are A4 or A0+, these days it’s possible to scan and save most size files into a PDF or TIFF file which can be then indexed to suit your preferences. Files can be indexed by project name, building name or even an associated reference number. Drawings scanning has saved our customers a great deal of time searching through awkwardly sized and difficult to navigate documents. Now all they need to do is a quick text search on their computer to bring the correct piece up in front of them almost instantaneously. It is also the next step in the way the industry is moving and has been for some time. Using large, industry quality scanners, drawings scanning providers like us here at Pearl Scan can complete the drawings scanning process much quicker than you would if you attempted the project in-house. Our experienced scanning staff feed the files through by hand, taking great care to not crease or damage the documents in any way. The file produced on screen is then checked and saved by a name of your choice in your preferred format. When all of your files are scanned and saved, they are sent back to you. We can also send your original drawings back if you decide you want to keep them, otherwise they can be shredded and recycled. The space saved can be huge and can make a big difference. There should be increased efficiency as a result of being able to easily scroll through the documents from the comfort of your own computer and the cost is not as much as you might think. If you would like some more information on our large format scanning services and how we can help your company, get in touch today. If you would like a free, no obligation quote for your scanning project complete our online form by following the relevant links below. What is Large Format Scanning? Do Your Costs Outweigh the Costs of Progress? Still Taking Large Drawings and Plans on Site? Why?